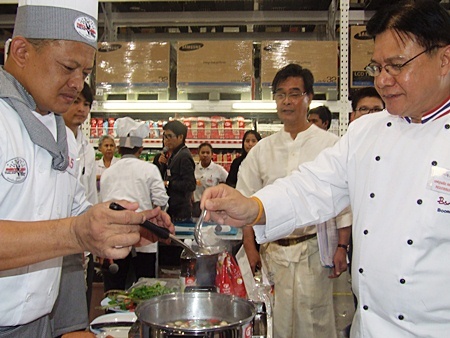 Ten teams of chefs from throughout Thailand faced off at Makro Cash & Carry’s “Horeca 2011” cooking competition to see who would qualify to compete for 200,000 baht in prizes at a national competition later this month. Professional hotel and restaurant chefs comprised the teams that set to simmering Feb. 17 at the Makro South Pattaya Branch. 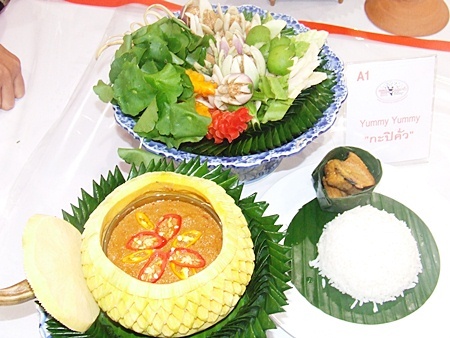 Traditional Thai dishes were the cuisine being judged with the top two winners advancing to the March 24-27 finals at Bangkok’s Impact Arena, where they will compete for the HRH Princess Soamsawalee trophy. 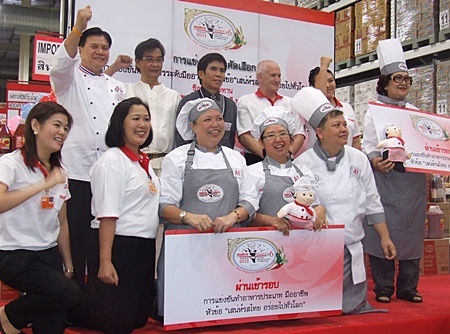 Thailand’s winner will represent Makro at an Asian cook-off in Singapore next year. Winning chefs, judges and sponsors all agree that it was a good contest. Supornsri Naktanasukan, store manager, presided over the event. 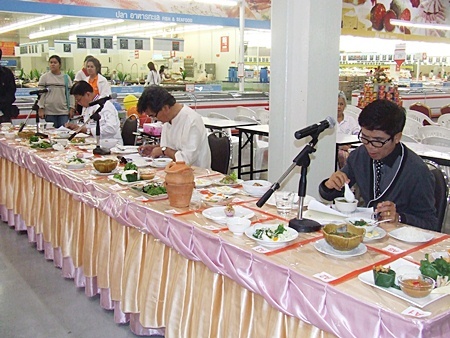 Judges were Chalee Amatayakul, Chef Booncherd Sornsuwan, vice president of Thai Cuisine Association, and Sa-nga Damapong, nutrition expert from the Ministry of Public Health. The winning teams were “Authayan Kaew 9 Manee” with lead chef Sombat Ngamsa-Ad who prepared a sour fresh mullet soup, and Team Yummy Yummy led by Sannipa Jiranuwat, which prepared roasted shrimp paste. Makro said the competition was aimed at raising the level of chefs in the tourist industry, both new and experienced. Chef Booncherd Sornsuwan (right) takes an early taste test of one of the contestant’s creations. Team Yummy Yummy, led by Sannipa Jiranuwat, prepared roasted shrimp paste. The judges have a difficult task deciding who won.